Inventory is a necessity for many businesses (retailers, distributors, manufacturers) and it is likely to be their largest current asset. The reason for having a sufficient amount of inventory is to meet customers' needs. Not having these items in inventory can result in lost sales and perhaps lost customers. On the other hand, having too much inventory can jeopardize the company's liquidity and may result in some inventory items becoming obsolete. When inventory items become obsolete because of technology or other innovations, the company will experience a loss of profits, equity, working capital, and liquidity. When a retailer or distributor buys goods to resell (or a manufacturer buys materials to create products), the company moves cash from its checking account (the most liquid asset) to inventory (a not-so-liquid asset). The challenge is to get the inventory items sold so the money gets back into the checking account. (Recall from our earlier diagram that the movement of cash to inventory and then back into the checking account is known as the operating cycle.) During the operating cycle the company will be incurring expenses and also the risk that the inventory will not sell as planned. For companies that sell goods, inventory is a key component of working capital, but it is not considered to be a "quick asset." The reason is it can take many months for the goods to be sold or turned over. During this time, the company's cash will be "sitting" in inventory instead of being available to pay suppliers, employees, bank loans, payroll taxes, etc. In short, having a large amount of inventory will mean a large amount of working capital, but that does not guarantee having the liquidity to pay the bills when they are due. The inventory turnover ratio indicates how often a company's inventory "turned over" during a year. Generally, the higher the number of times the inventory is sold or turned over in a year, the better. After all, getting a company's cash out of inventory and back into the checking account means less risk, less holding costs, more profit, and more liquidity. Since inventory is reported on a company's balance sheet at its cost (not at selling prices), the inventory's cost should be related to the company's cost of goods sold (not to its sales revenues). Basically, the formula for the inventory turnover ratio = cost of goods sold for a year divided by the average inventory cost during the year. 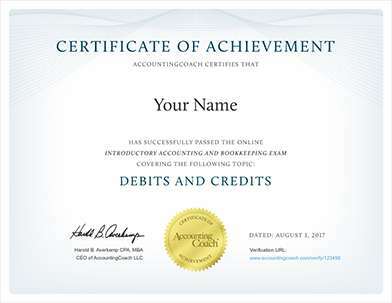 Unfortunately, the cost of inventory reported on the balance sheet pertains to the final moment of the accounting year, while the cost of goods sold is the cumulative amount for the entire accounting year. Relating the cost of inventory at the final moment of an accounting year to the cost of goods sold throughout the entire accounting year presents a problem. 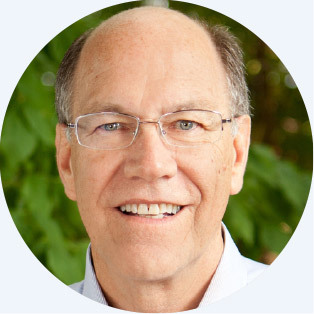 The solution is to find and use the average cost of inventory that is representative of the inventory cost throughout the entire accounting year. 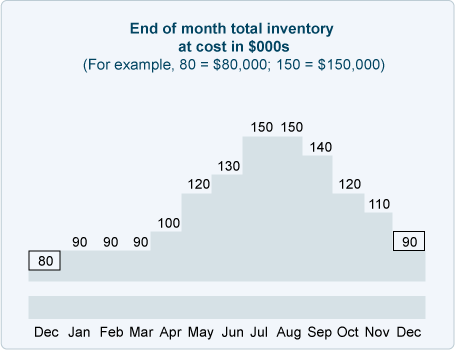 To illustrate why the inventory cost that is reported on the end-of-the-year balance sheet may not be representative of the average inventory amounts throughout the year, we prepared the following chart for a hypothetical company with a seasonal business. As the graph indicates, this company's inventory levels are highest from May through October. Therefore, It is logical that its accounting year should end on December 31 since this is the lowest point of the business activity. When the average inventory for a year is calculated using a company's annual financial statements, it is likely that the average will be based on the cost of the inventory at the beginning of the year (which is the ending inventory from the previous year) and the cost of the inventory at the end of the most recent year. In our graph we see that the beginning-of-the-year inventory was 80 and the ending inventory was 90. By using only these two moments, the average inventory cost will be calculated to be $85,000 (80 + 90 = 170 divided by 2). When the average inventory for the accounting year is calculated using the cost of the inventory at the beginning of the year plus the cost of the inventory at the end of each of the 12 months during the year, the average inventory cost will be $112,308 (80+90+90+90+100+120+130+150+150+140+120+110+90 = 1,460 divided by 13). Now let's see how the two calculations of the average inventory cost will affect the inventory turnover ratio. For these calculations we will assume that the cost of goods sold for the entire accounting year was $360,000. Since the average inventory of $85,000 (from using only the two end-of-the-year amounts) was not representative of the actual inventory amounts throughout the year, the resulting inventory turnover ratio of 4.2 times is not a good indicator of the number of times that the inventory had turned over during the year. Since the average inventory of $112,308 (from using 13 points throughout the year) was more representative of the actual inventory amounts during the year, the resulting inventory turnover ratio of 3.2 times is a better indicator. Ratios are most relevant when they are used to reveal a financial ratio trend within one's own company. When used within one's own company, the financial ratio calculations will be consistent. Ratios could be relevant when comparing companies that are within the same industry. The financial ratios of a company in one industry will not be comparable to the financial ratios of a company in a different industry. There could be several reasons: types of products, business structure, manufacturer versus service provider, credit terms, etc. Now let's do one more calculation of the inventory turnover ratio by using some new information. Let's assume that a company's income statement for a recent year reported the cost of goods sold of $720,000. It was also determined that the average cost of inventory throughout the year was $240,000. This calculation shows that the company's inventory "turned over" on average 3 times during the year. However, this is an average consisting of some products which may have turned over 10 times during the year, some products turning over two times during the year, and some products for which no sales occurred during the entire year. Related to the inventory turnover ratio is the day's sales in inventory, which is the average number of days it took to sell the average amount of inventory held by a company during a prior year. In other words, it indicates the number of days (on average) it took for the inventory to turn over during the year. Recall that the days' sales in inventory was one of the two components of a company's operating cycle. The 120 or 121.7 days of sales in inventory is an approximate average time needed to sell the average amount of inventory during the past year. Some products may have sold quickly because of high demand and some products may have been sitting without any units being sold during the year. The financial ratios of a company in one industry are not likely comparable to the financial ratios of a company in a different industry. The reasons could be numerous: types of products, business structure, manufacturer versus service provider, credit terms, etc. So far, our inventory calculations were based on a company's total inventory. Since people within a company have more detailed information, the concepts we used for the total inventory can also be applied to each and every item in inventory. For example, with a computer system it is relatively easy to show the inventory turnover and the days' sales in inventory for every one of the products in inventory. This will provide company personnel with more helpful information for managing inventory. Highlighting the items that have more than 120 days' sales in inventory may lead to action that will help the company. Perhaps some items haven't been sold in the past year and should be sold at a clearance price or scrapped to save the costs of holding. Perhaps the method of calculating the future quantities to be purchased or produced should be improved. To learn more see our topic Inventory and Cost of Goods Sold.